This memorial was erected to honour the memory of those members who made the supreme sacrifice for their country in the Great War 1914 – 1918. This plaque is very decorative,with an ornate frame, at the top of which is a roundel showing a stag on a shield. It was perhaps not intended to be placed outside so it is protected with glass, which makes it impossible to photograph on a sunny day. 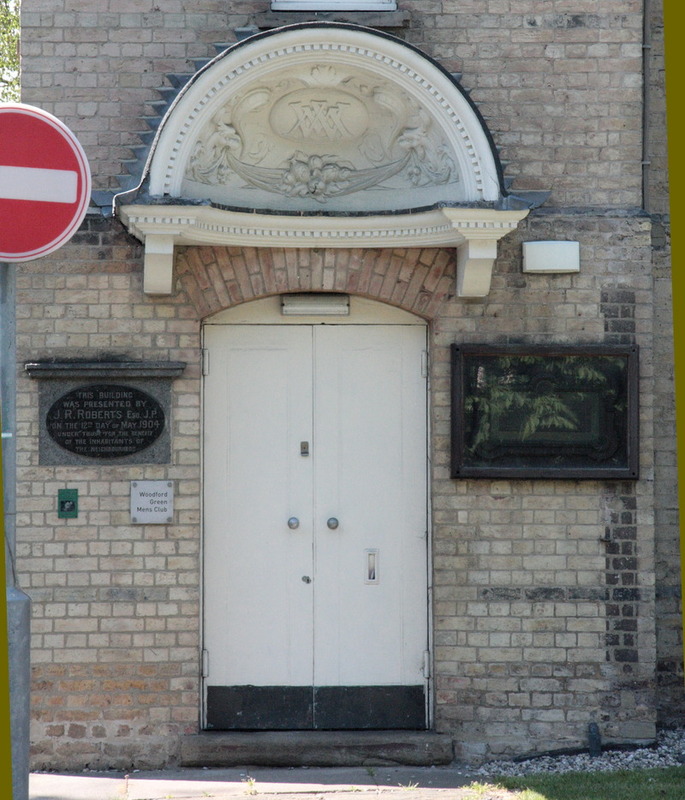 We plan to go back and try again but meanwhile we're showing both plaques and the door with its ornate hood with the monogram, "WM" for Wesleyan Methodists. The list of names is in alphabetical sequence except that Silver is at the end. However the layout of the list (4 columns of 3) means it is not clear whether Silver was a last-minute addition or not. This was built as a chapel for independent Wesleyans in 1869. A replacement church was built elsewhere in 1904 and this building was bought by Sir J. R. Roberts, who presented it for public use. by 1965 it was in use by the Club. Bucks Free Press describes the residential accommodation that it became in 2005. 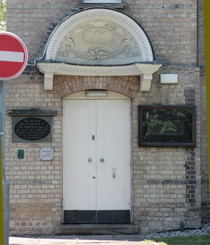 The Roberts plaque is the left of the door, WW1 to the right. This is a foundation stone for the building.